The Classic Dog Fence pet fencing is a modern and highly effective system enabling you to keep one or more dogs in complete freedom within a perimeter, fenced or unfenced, you have defined. You define your dog's play area by installing a wire, called antenna wire, around the authorized perimeter. This wire placed on the ground, buried or raised on an existing fence carries a radio signal from the transmitter. 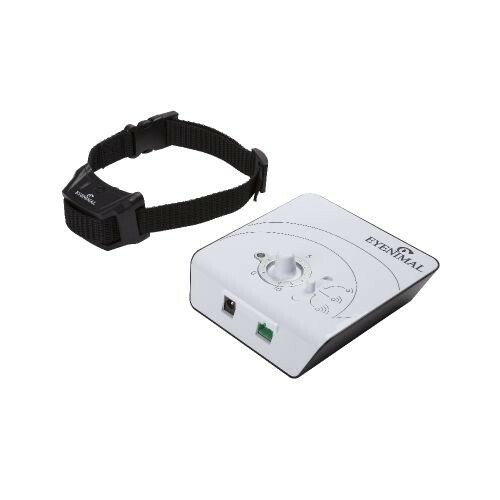 When your dog, wearing a receiver collar, approaches this wire, he is warned by beep sounds that he is too close to an area where he is not allowed; then if he carries on, static stimulation will be emitted by the collar. Your dog will have to leave the unauthorized area to stop the stimulation and beep sounds. For the system to operate, the wire must be connected to the transmitter and form a continuous loop from the transmitter and back again. An unlimited number of receiver collars can be used with one transmitter: you can keep as many dogs as you wish safely in the same area. Transmitter dimensions: 117 mm x 110 mm x 28 mm (4.6" x 4.33" x 1.1"), power: 220 V AC. Receiver collar: weight: 58 g battery included (2.04 ounces), dimensions: 59 x 39 x 31 mm (2.32" x 1.53" x 1.22"), power: 1 3-V CR2 Lithium battery (supplied). Gray nylon strap - length 64 cm (25") / width 20 mm (0.79") - adjustable for neck sizes from 17 up to 55 cm (16" to 21").